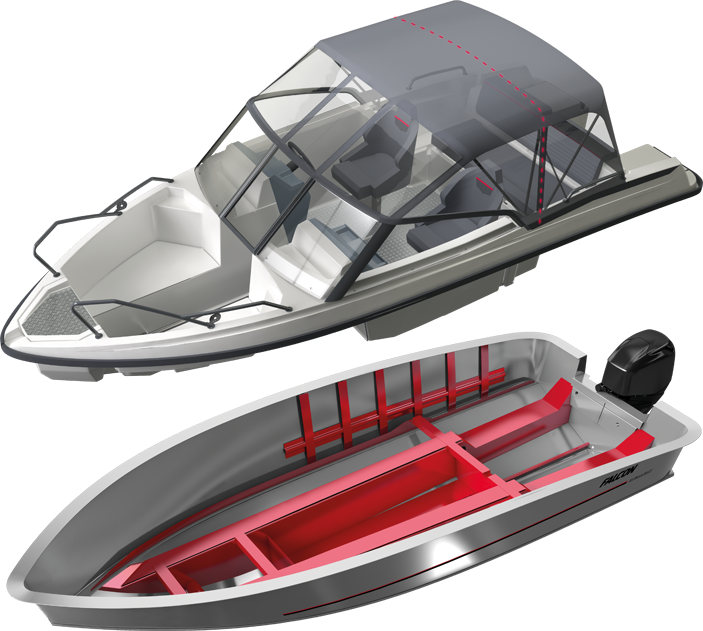 Falcon aluminium boats have been designed utilising the boat manufacturing experience of Bella Boats that dates back almost half a century. As a result of persistent development, planning and testing emerged a range that is able to offer the most versatile space solutions in its class, along with streamlined design that is both stylish and practical. Campnou Oy, based in Ähtäri, Finland, possesses comprehensive knowhow of manufacturing aluminium hulls. This ensures cost-efficiency and high quality at all stages of the process. The outcome is no less than the market’s leading boating experience. The V-shaped hull with no lifting strakes and with wide bellows provides stable, soft and quiet ride under all circumstances. The co-operation between two seasoned Finnish boating specialists, covering the entire process from design to manufacturing, has resulted in a unique range that is able to offer a dream boat for every need and purpose.